Explore the nooks and crannies of the isles by taxis which offer half or full day tours of Mahe and Praslin. La Digue offers leisurely transfers from the jetty by ox-carts as well as the more conventional taxis. It is advisable to check fares in advance with the taxi driver. Use lonely licensed taxis identifiable by the ‘TAXI’ light on the roof of the vehicles, and by the driver’s identification badge. Daily services on Mahe and Praslin operate between 05:30 and 19:00. Weekday schedules operate every 30 minutes from most areas throughout Mahe to Victoria. Timetables are available either from the Central Bus Depot or from the local Seychelles Tourist Offices. Hiring a bicycle will enable you to explore the islands at your own pace, stopping by virgin forests and at artist’s galleries and wayside restaurants on your way to trackless, white powdered beaches. Embark on a personal adventure through the islands of Mahe and Praslin, taking in mountain vistas, secluded bays and off-the-beaten track restaurants. Traditional, sail-assisted schooner-type ferries and a modern high speed Cougar catamaran operate in Seychelles. On Mahe, ferries operate from the inner-island quay in Victoria to Baie Ste. Anne on Praslin, and to La Passe on La Digue. Local artists apply their skills across a broad spectrum ranging from rustic to the refined, working with materials that include stained glass, coconut shells, coral, fibres, bamboo, metal and pottery. 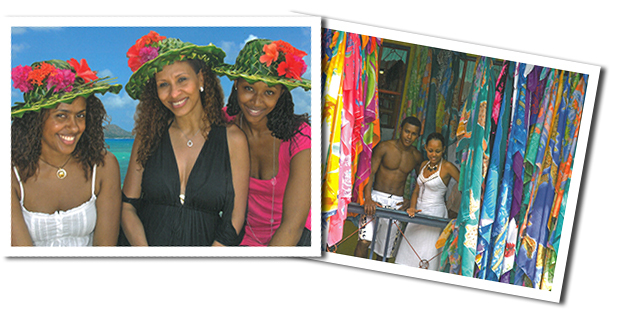 You can also shop for locally-made artefacts, baskets and bags, pareos, books and clothing in Mahe, Praslin and La Digue as well as in many hotel boutiques and out-of-the-way galleries. The national airline Air Seychelles operates scheduled flights from London, Paris, Rome, Mauritius, South Africa, Hong Kong (direct flight from Hong Kong to Seychelles will be launched in late March 2013) etc. Qatar Airways, Emirates and Etihad Airways fly to and from Seychelles with connecting flights to various worldwide sectors through Dubai, Doha and Abu Dhabi. Other operating airlines include Air France, Kenya Airways, Condor, Air Austral, Air Mauritius. Private aircraft are welcomed at Mahe International Airport after having cleared all relevant formalities with the Civil Aviation Authority.